The heat insulation material of the box is made of foamed plastic foam at the site of polyurethane, which has strong anti-interference ability to the external heat (cold) source. 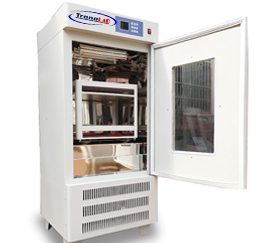 The working chamber is equipped with air duct and uniform temperature distribution. The inner wall is made of stainless steel and has good corrosion resistance. The heating system in the environmental temperature is 5 ℃ to heat up to 50 ℃. Refrigeration system to cool to ambient temperature 32 ℃ during 5 ℃. The universal spring test bottle rack is especially suitable for the cultivation equipment of biological samples for a variety of comparative tests. Stepless speed regulation and safe operation. Temperature control accuracy, digital display. Explicit double oscillation incubator is a two-way thermostat heating and cooling system, biochemical incubator and temperature controlled oscillator combination, plants, microorganisms, biological, genetic, viral, environmental protection, food, medicine, petroleum chemical and other scientific research, education and production department training preparation for precision laboratory equipment indispensable. 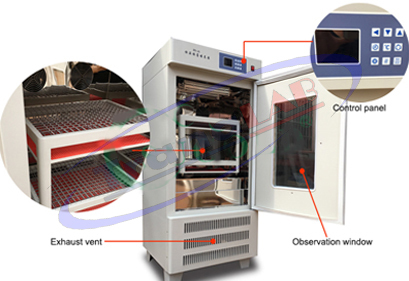 The box of the double-layer oscillating incubator is heat insulation material, and the polyurethane foam in situ has strong anti-interference ability to the external hot (colt) source. The working cavity is equipped with air duct, and the temperature distribution is uniform. The universal spring bottle holder is particularly suitable for the cultivation of biological samples for various contrast test. Stepless speed regulation, safe operation. Temperature control precision, digital display.